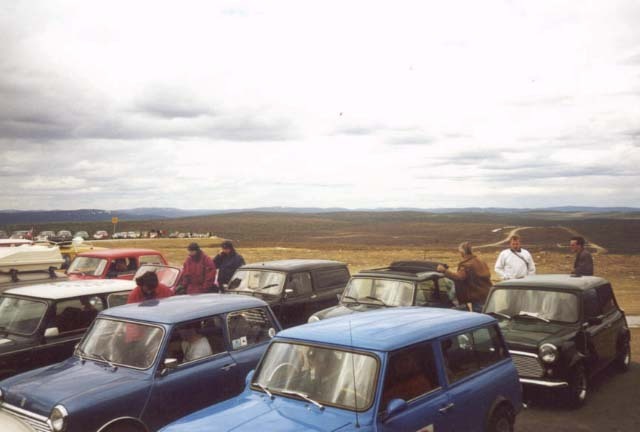 In 2000 the IMM was organized by the Mini Club Flying Finns ry in Saariselka the 8th through 12th of June. 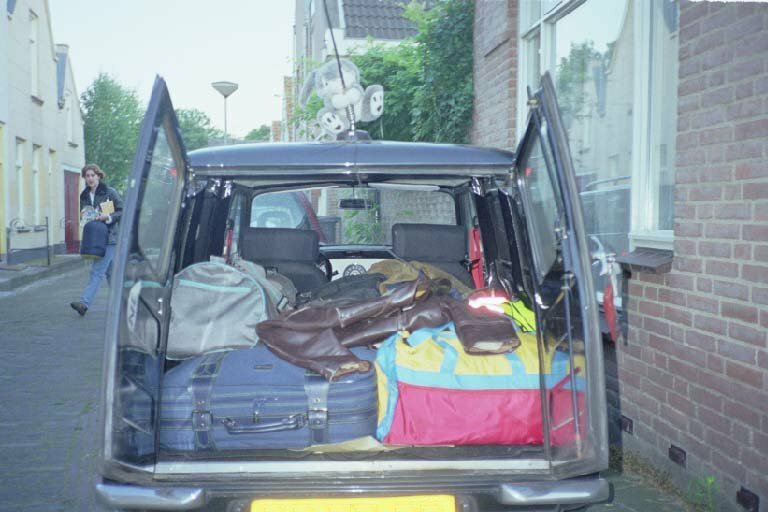 The 'preparations' for this trip started even as long as 1½ years before the actual event. The actual preparations were done closer towards the event though; a couple of months in advance for most. The pages used (by me anyway) to do the preparation can be found here. Some scans of newspaper-article's and other IMM related documents can be found here. As the event was getting closer, my Karma was getting worse. First, two of the people who were interested in joining me had to cancel, secondly just two weeks before the event and one week before the start of my holiday my gearbox sort of started to disintegrate, as you can read in my report of my Brussels - London - Brighton trip. My Mini-shop, Mini Parts International, came through for me big time though (no matter what others say :) enabling me to make the trip in my Van afterall. Had the day off to do all my preparations for the trip and clean up my house a bit as John & Yvonne, International Mini-List Lister (IL) and Andy (IL)& Manon , a Dutch Mini List Lister (DL), would be coming over on Sunday before we would leave on Monday. Didn't feel very well, so the preparations took a long while and I hadn't finished yet before I left for a short break in the south of NL with my family. Thu 1st June - Sa 3rd June. Was spend on a short break with my family. As I was away for the weekend before, I couldn't set off for Saariselka until Monday the 5th. 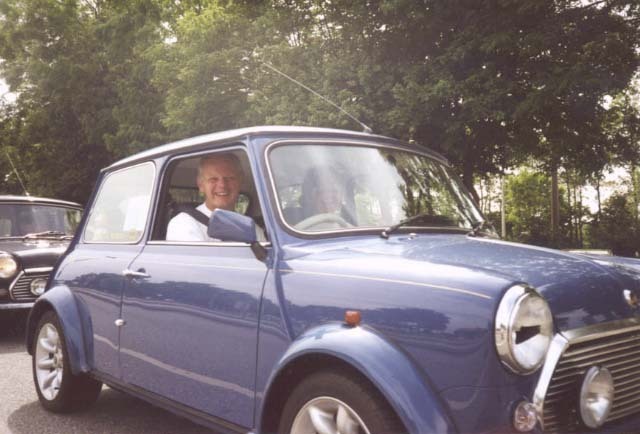 I was driving up north together with Mr & Mrs 'EngPow' (John & Yvonne England) in their Mini 40 and 'Andy in Belgium' and Manon in Andy's British Open. I set off back home at around 11:30am and on my way stopped at Manon's place where Andy had already arrived. Drove back to my place, where John & Yvonne had also already arrived. So first we hung around a little, had lunch and talked for some time. With the IMM starting on Friday we'd planned to arrive there Thursday evening. This meant we sort of had to keep a 'wo/men on a mission' pace for the drive up doing about 800km the 1st and 4th day and 600km the 2nd and 3rd day. To start off well we got up around 7am. Given that our getting-up-rituals weren't in sync yet we didn't actually start driving till about 9:45 though. Upon departure I got a SMS message on my mobile from HW (Hans-Willem to those in the know :) (IL/DL) and his navigator Remco who at that time just had entered Sweden. Their progress was reported en route on www.remcom.org, which gave those that had to stay behind a chance to get a bit of look and feel of the event. The SMS messages proved to be an asset to keep all the teams up2date of each-others progress and to set up meetings along the way. John & Yvonne -Ferry Denmark ? Apart from a slight navigational glitch for Andy and Manon at the start, due to an inclarity in their routedescription the drive up to the Puttgarden-Rodby ferry was pretty uneventful. On the ferry I caught up a bit on my lack of sleep of the night before and consequently sort of missed to call to return to the cars. 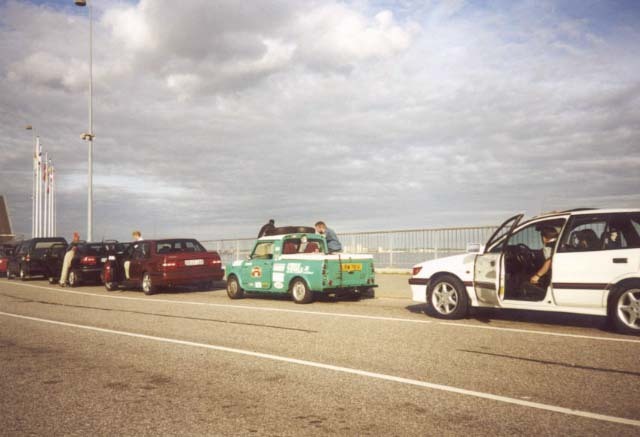 Thus I found the others waiting in their Mini's on an otherwise clear cardeck :) On the way through Denmark we saw a number of bikers going our way. Through talking to a bunch of them at gas-stops we found they were heading for a biker-meeting in the south of Finland that coming weekend. In Stockholm we hit some rush-hour traffic. 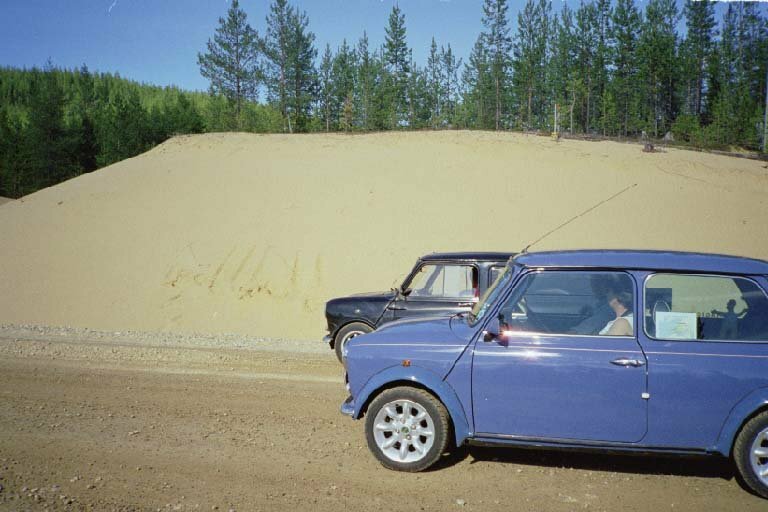 While moving along slowly we suddenly saw two Mini's parked on the side/up the embankment. Of course we stopped. 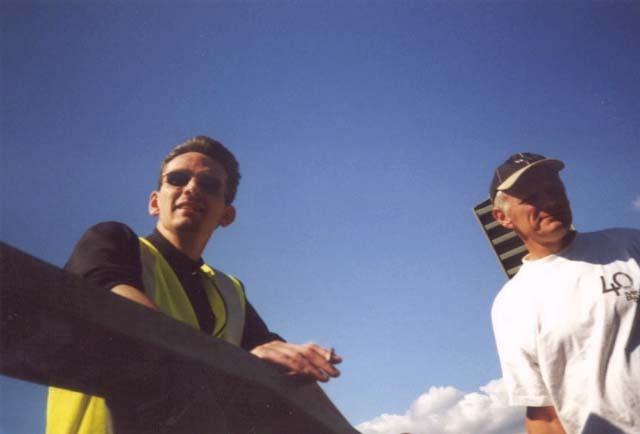 Turned out it was Henko and Dennis who were helping Rik (DL) with some fuelproblems he was having. 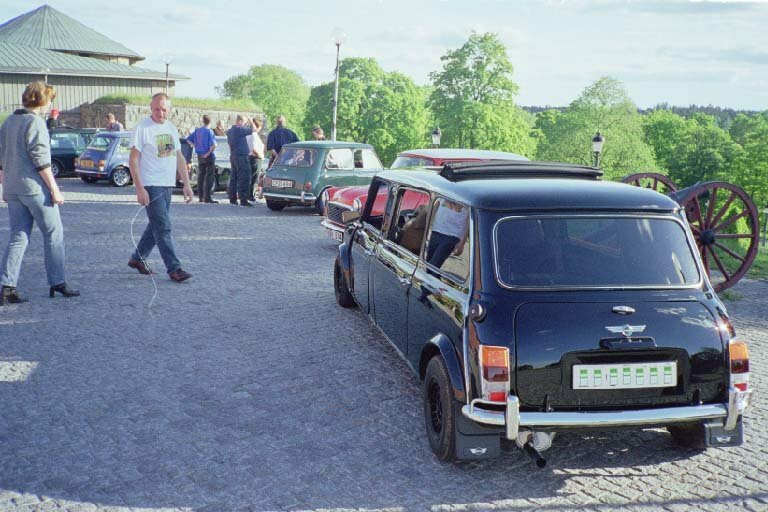 Eventually, with the help of Andy among others, the problem was sorted (we thought :) and we all continued on our way towards Uppsala, our destination for that day to meet Micke (IL) and some other Swedish Miniacs. 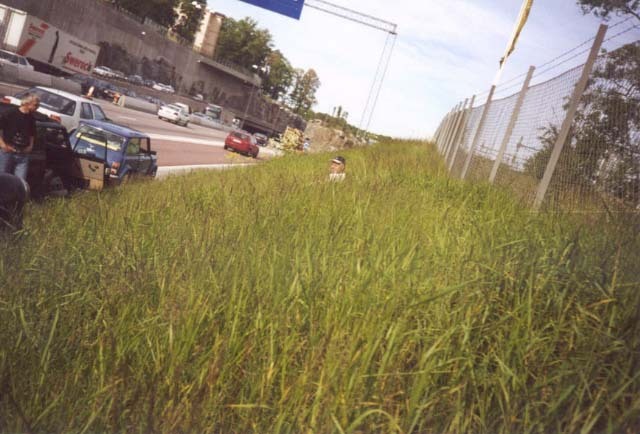 In Uppsala we met Micke at the end of the highway. End of the highway ? Yes indeed, from there on it was the before mentioned two-lane roads all the way up. Manon & John (left) Onto Old- -timers Oops ? T - Torkel, M - Micke, L - Linnea, J - Joakim, H - Henko, D - Dennis, M - Manon and Andy's hands. Got to meet Carin's friend Staffan, had some breakfast and on our way we were. That is... not till after some who'd forgot a couple of things went back and collected them :). Meetingpoint with the others was at a gas-station just outside of Uppsala. 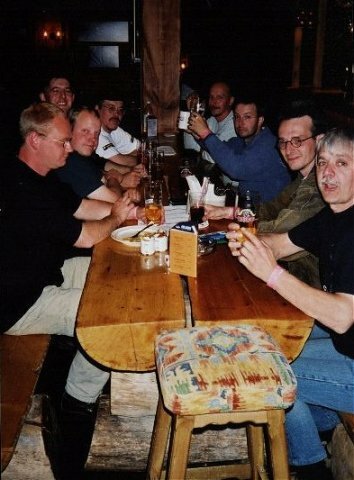 We decided that driving a big convoy wouldn't be a good idea, so Henko & Dennis and Rik joined us while Theo and Henk joined Micke and his team. The morning had started out again with rain and just before Gavle my wipers decided to give it a miss. Turned out the wipercable had broke close to the wiperengine. Fortunately Micke and his team stopped at the same place we had and he arranged for us to go over to one of his mates, Peter, home in Gavle, who supplied us with another cable, though a bit shorter one so I now only had one wiper left. While work was done on my Van, the others had a good look around the beautiful shop and Mini's that Peter has. By that time the rain had gone and the drive up north was a sunny from there on. 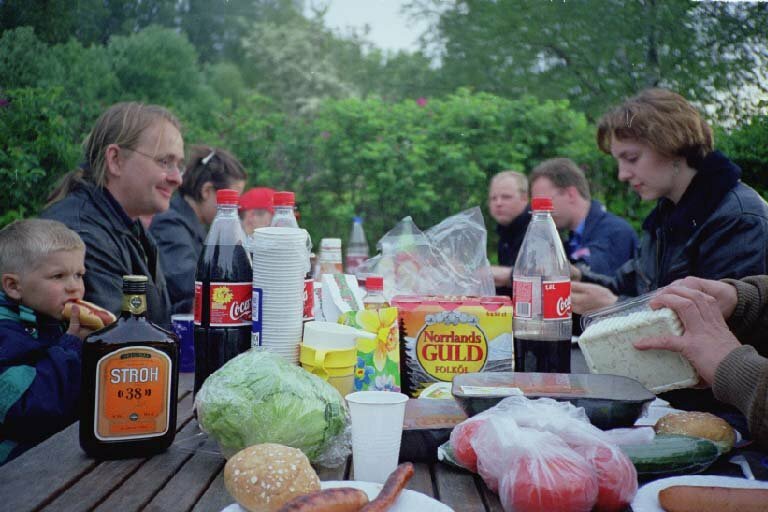 In Sundsvall we had agreed to meet Team M.I.N.I., consisting of Scott and Kim, Andy and Sara Browne and the Smith's; Chris, Ann and Emily, for lunch. 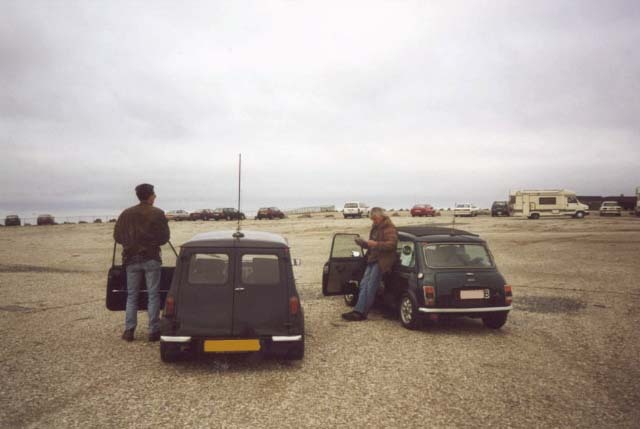 We arrived there at about 2pm but found no other Mini's there. 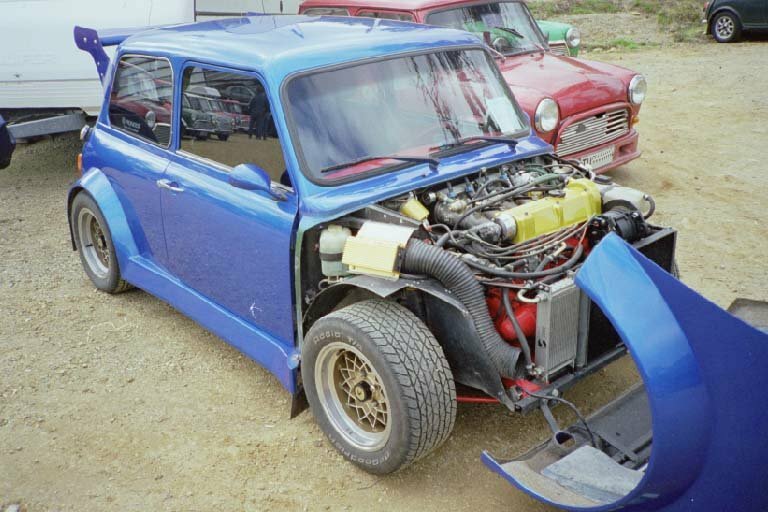 Nor had the people working there seen any other Mini's there yet that day. After a while Micke and his group caught up with us again. We had lunch till about 3pm, even spotted some English Mini's passing, but no show of Team M.I.N.I. Gave a call to Chris Smith who said he was about 2 hours behind Team M.I.N.I. which would mean they were already ahead of us. So we decided to head on as we hoped to reach Umea that day. 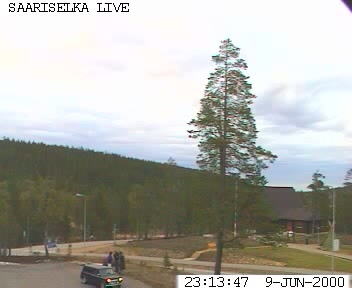 Said goodbye to Micke and party, as they were heading for Ornskoldvik. 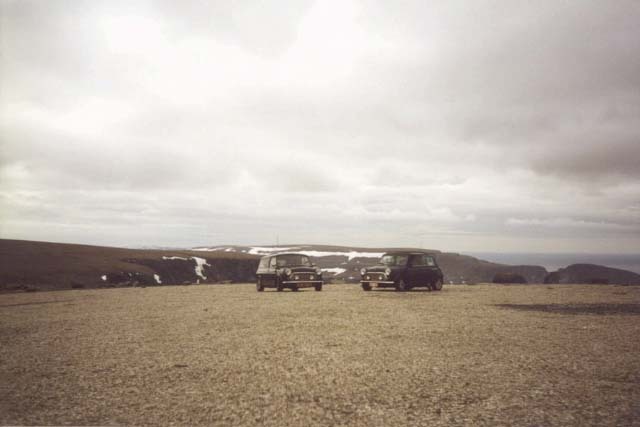 When we got to Ornskoldvik and stopped to take in some gas, Rik's Mini was playing up again. The carb was pulled again, an inline filter installed and things seemed to be fine again. In the mean time Henko sorted a loom-problem by bypassing one of the wires in it that had burned. 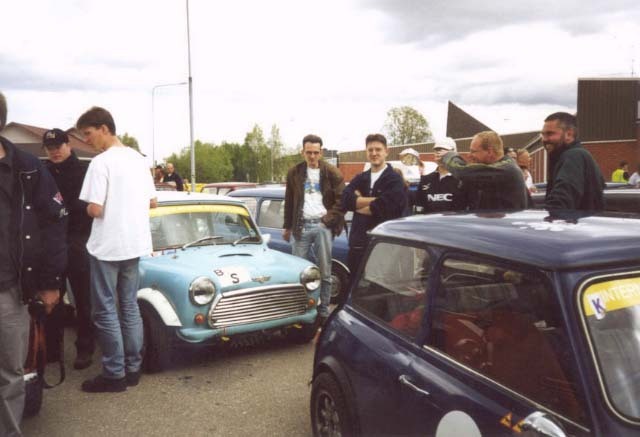 While working on the cars, some local Miniacs; Hakan and Micke (other-one :) also arrived. As I had let Micke know where we were he had given them a call to see if they could be of some help. After about a mile or so we had to stop again. 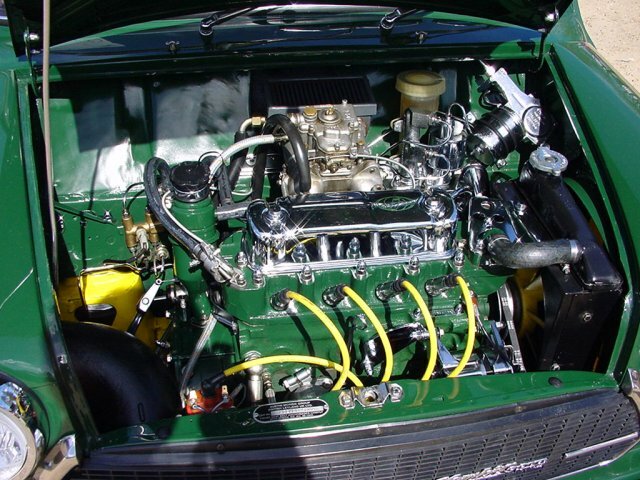 And yet again Rik's carb was pulled, new gaskets made etc. By then we had lost some time so I called ahead to the campsite in Umea and made reservations for the 8 of us for the night. 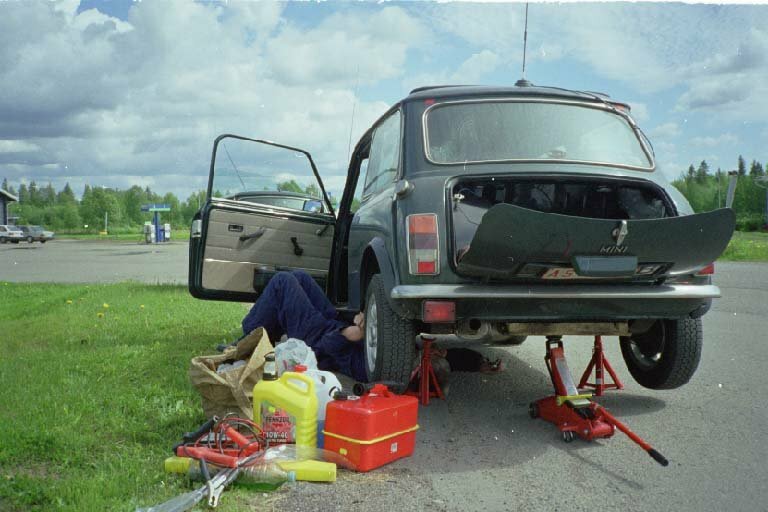 While on the side of the road (some working on the Mini, others enjoying the sun :), Micke also stopped there for a while, as well did Hakan again. Chris Smith also stopped and told us they were also heading for Umea. 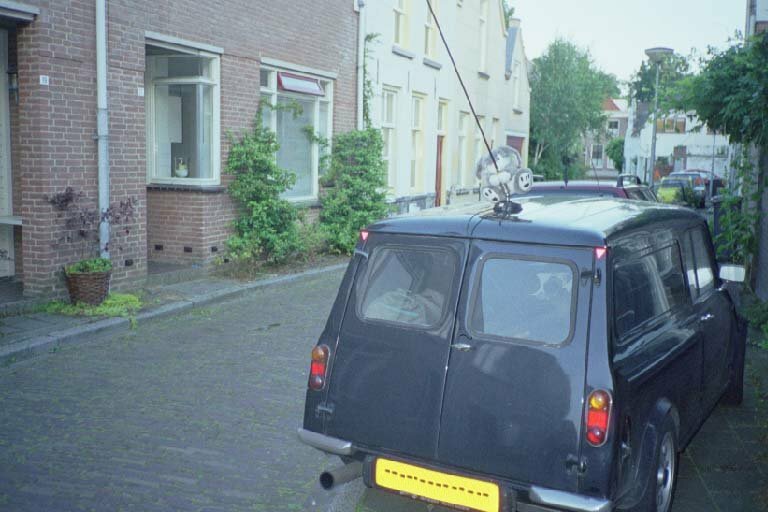 When leaving Hakan's Mini gave up and he had to be towed home by some friends. Team M.I.N.I. had already left by the time we were ready to go and we didn't see them again till later that evening. The day's goal was Saariselka. Had the by that time usual problems with Rik's fuel-feed. 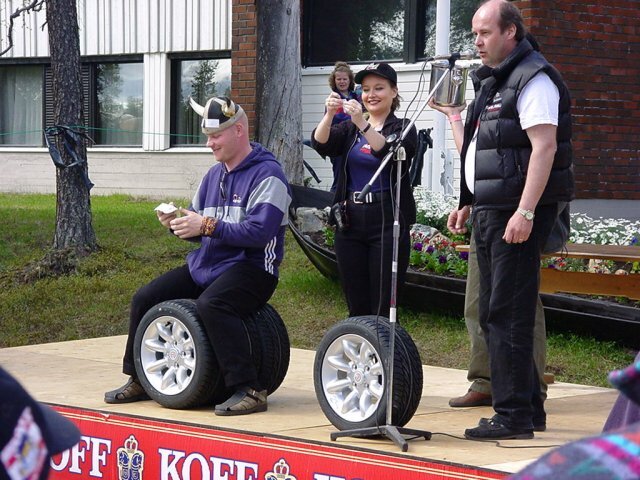 Don't know if we stopped two or three times, do remember stopping in Skellefttea under an overpass and checking out the local 'Babes' together with John (when it comes to fixing cars I'm more of a supporter and consultant then an actual worker :). Reached Finland around 5pm/6pm local time and continued on our way, stopping just north of Rovaniemi to do the 'tourist thing'; make a picture of the 'arctic circle' sign and a 'drive by picture' of Santa's post-office. Around 10pm we arrived at Saariselka and after a short run-around found the big 'IMM 2000' banner at the Tunturi hotel complex. At registration we got to meet Johanna, who's looks turned out to fit her nice personality. As Rik hadn't registered nor made any other reservations yet, he posed as my 'babe-navigator', albeit bringing a Mini of his own :) While registering I met Jukka (IL) and also caught up with Team M.I.N.I. again. 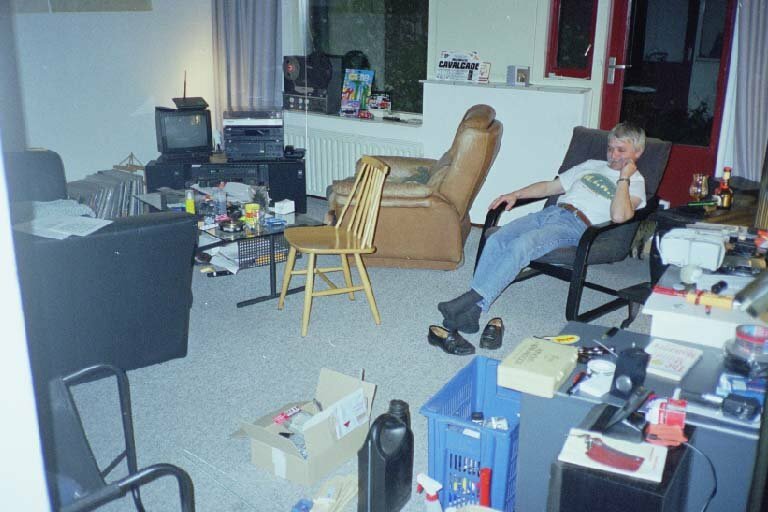 The apartment I'd arranged the 7 (John, Yvonne, Andy, Manon, Rik, Henk and myself) of us to stay in was a treat. Jacuzzi, Sauna, 3 bedrooms, living, you name it. As it turned out most (all ?) of the Dutch attendees were in the apartment next to us, which was even bigger. After getting settled in we walked down to the bar and had a bite to eat. Also met up with Team M.I.N.I. there and got to talk to Kim a bit more as well as a lot of the 'old' and 'new' faces that attend IMM's. I guess it must have been around 3am when we got to bed. Although with no darkness at anytime to give you a hint whether it was day or night and since I don't really 'do' time to begin with, my sense of time and even days was already way out of sync by then. 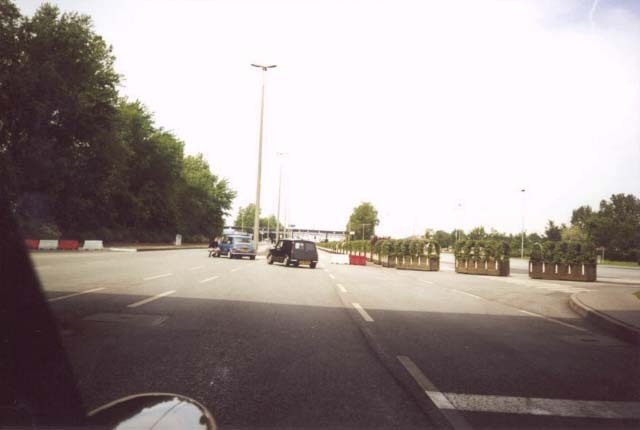 The official start of the IMM 2000. Which I missed because I was still in bed by that time :) I also missed Johanna being proposed to by Antti and accepting; I guess they'll remember this IMM till the lengths of time. I did get up around 10am, woken by my mobile that I'd forgotten to turn off the night before, followed by the sound of Yvonne filling the dishwasher. Didn't really wake up till about 12pm though after which I took a nice long bath in the Jacuzzi while some of the others set off for a trip to the Russian border. 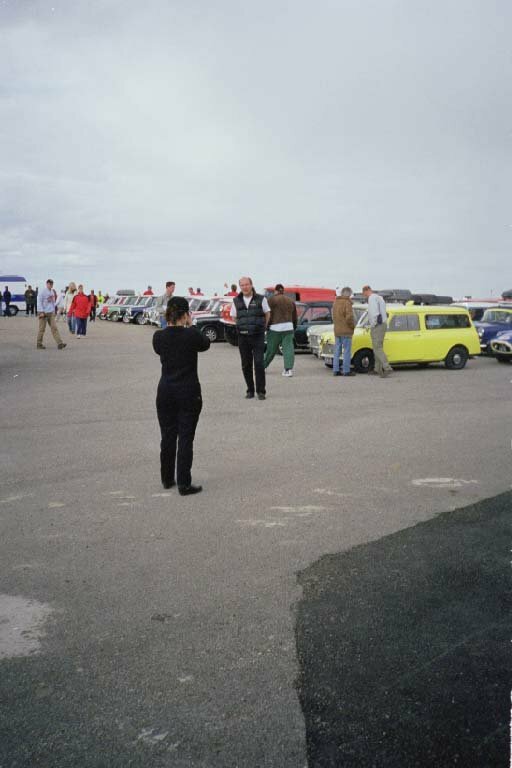 By the time I felt all revived again Henk had arrived and got settled and John and Yvonne had returned and we headed over to the display area where all the Mini's were parked. There were several reasons I'd decided to go to this IMM. 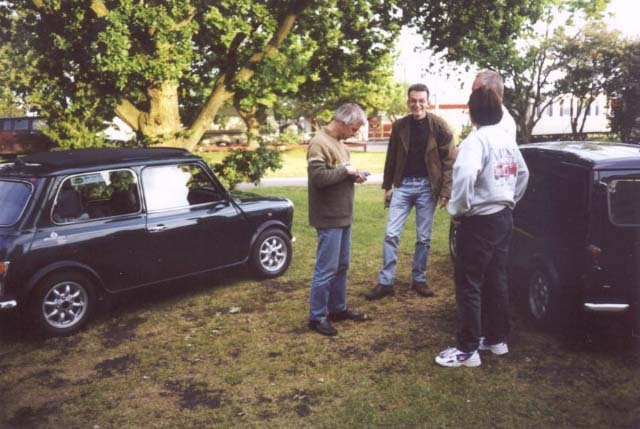 One being it was an IMM and these events usually are a lot of fun; a weekend long party with fellow Miniacs. 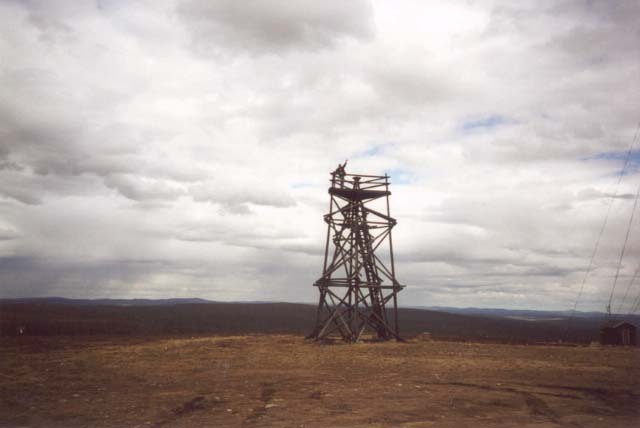 A second was the fact that it was such a long way to get there; 250km north of the Arctic Circle, which only added to the adventure of it. Also, since the event was held a 'mere' 450km south of the North Cape, a place I've been planning to go to for some years, it was a perfect excuse to finally do that, and even in the Van as well. Then of course it meant meeting a number of my international Mini-friends again, some of whom I only get to see every other year or so. 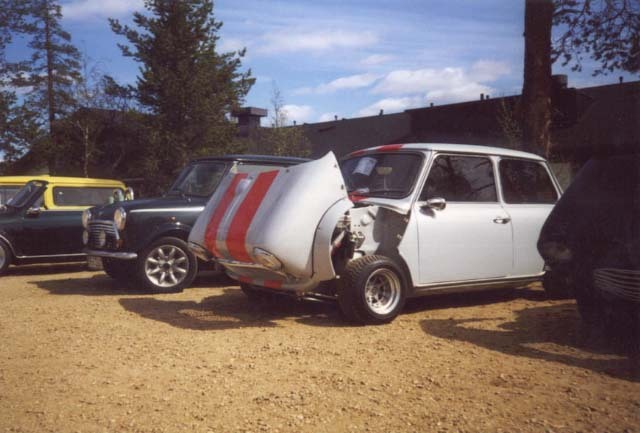 And last but certainly not least, through a couple of these friends I knew that Fins have a special attitude towards cars and Mini's are no exception. 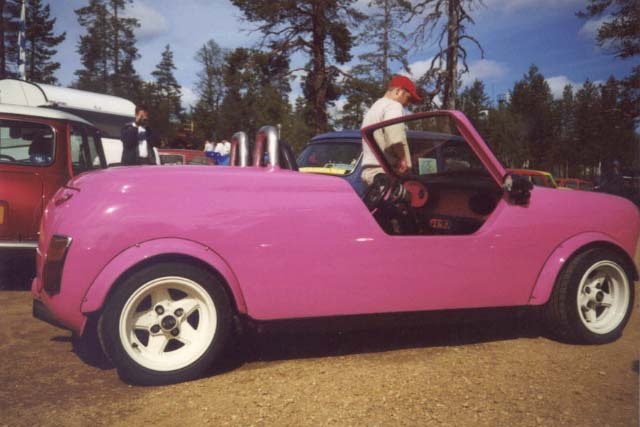 Although it was still a bit hush-hush, I knew there were going to be some very unusual Mini's there. 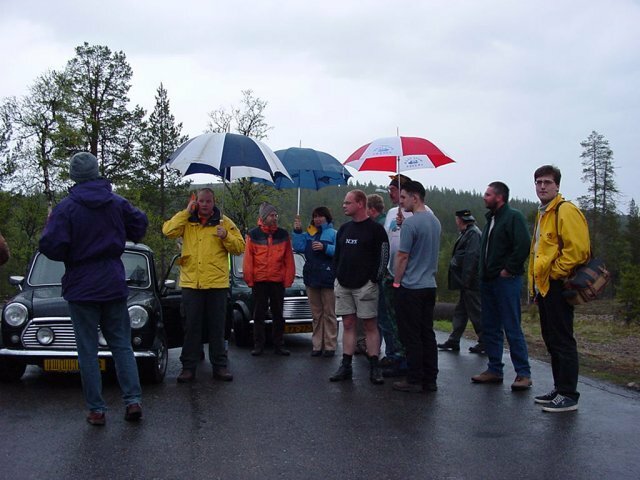 So with three directives already accomplished (we were there, had met some of the other Miniacs and already had started the party :), we spend the afternoon meeting some more of our Miniac friends and checking out the Mini's on display. 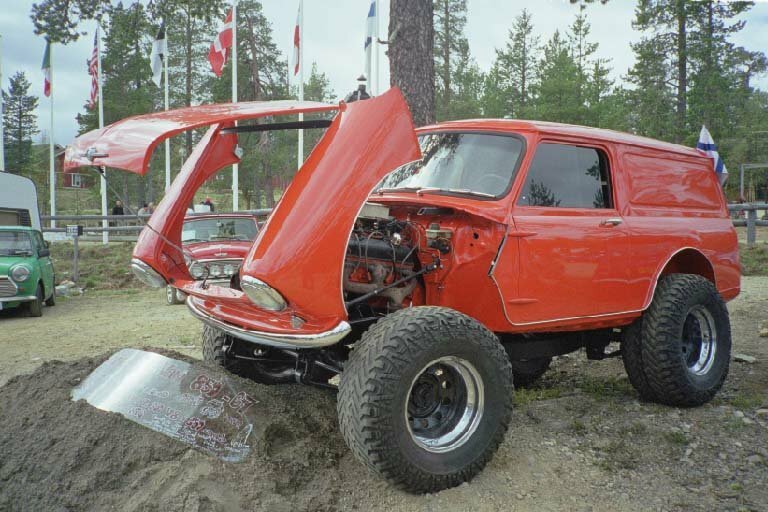 Just his Mini's Big Wheels ! 8 Porter Pink Next Year Inno-Estate ? In the mean time some more IL-ers had arrived. John Bullas AKA 'Fat Bloke' for one had made it and immediately started a search for a lift back as he'd only been able to make arrangements to get to the IMM but none to get back. Also got to meet Marcin and his wife Minna as well as Pasi R. in real life for the first time. After having some bar-food again we got the idea of setting up a virtual meet with the people back home through the webcam in Saariselka. John and Yvonne already knew where the webcam was at so we placed my Van in a strategic position and I called my brother and Rien, a friend of mine, who then guided us to the place where we were sort of visible on the webcam. 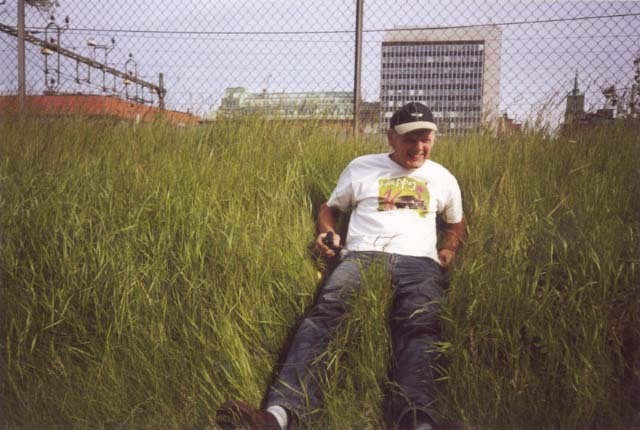 (See the, although not entirely accurate, entry for June 9th and 10th in Rien's online journal 'Reality Asylum') As the cam only took a picture every couple of minutes it took a while to find the right place to stand. 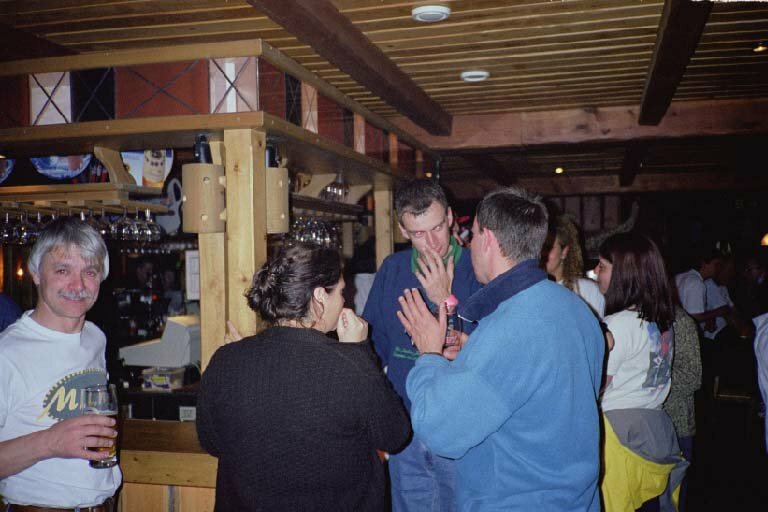 H - Henk, S - Scott, Ho -Henko, J - John B., T - Theo, R - Rik, A - I, An - Andy, N - Neil, Grms - Couple of German ladies, ? - ??? Which we did. Also talked to the guys we met at the ferry in Helsingor again, who arrived from a roundtrip they made that day to the North Cape! 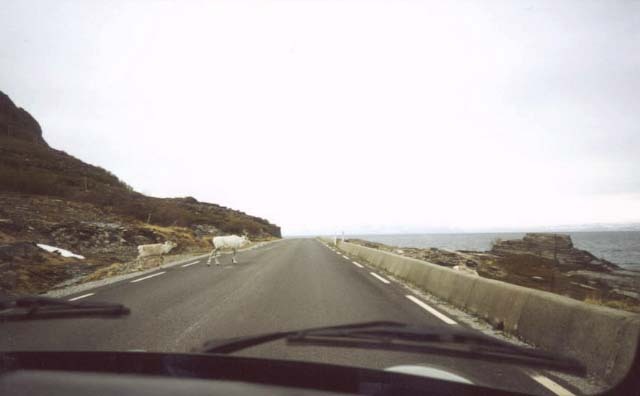 They told some horrorstories about the roads leading up htere, but their PickUp was still going strong. At about 3am in the morning I think (it felt like it was 3am anyway, but as I'm supposed to have said; "I don't do time. 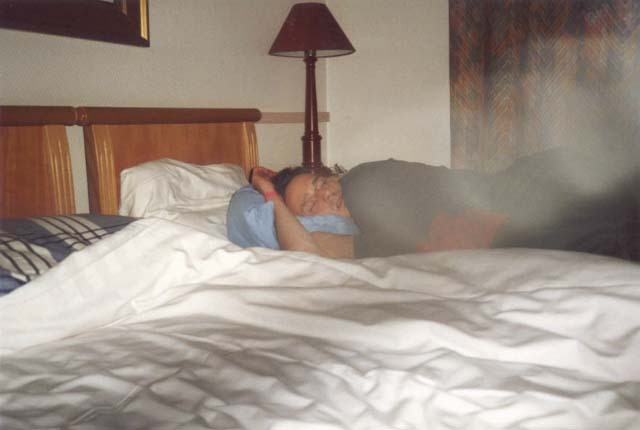 I go to bed when it gets dark", which those who know me know not to be true :) we turned in. Along the way we stopped to enjoy the scenery and ehhh... enjoy it some more :) When we got back it was time to wash the Mini's again as the sand was literally everywhere. I guess I'll still be finding some of it somewhere in my Van a couple years from now. 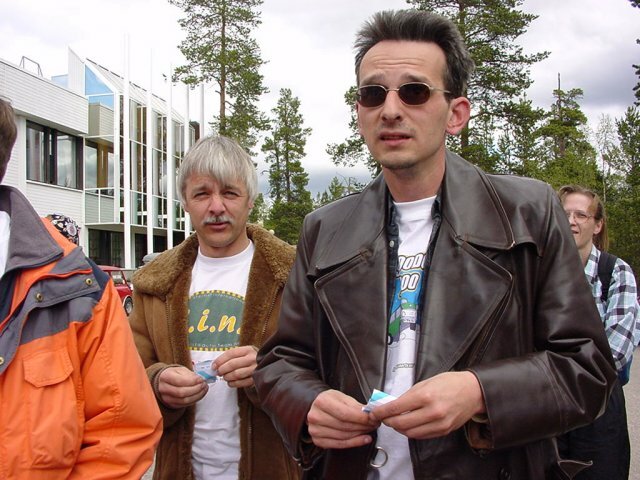 Onto Russia Henk @ border Onto Murmansk ? After dinner and some (Mini ? :) talk we went outside as it was about time for the virtual meet at the webcam. Unfortunately this was one of the few times where it was raining and thus cloudy and a bit on the cold side. So the boys(m/f) were separated from the men(m/f) as some decided they liked the warmth of the X-mas party (Santa was singing the blues by then :) better. An - Andy, A - I, Ho - Henko, Y - Yvonne, T - Theo, H - Henk, Jb - John B., Mi - Micke, S - Scott, Ma - Marcin, Ju - Jukka, J - John, R - Rik, Ab - Andy B. After having done the virtual meet (and confirmation that we indeed had been seen by some), some headed back to the apartment and hung out there for a while. Gave Jukka the badge I'd brought for him and even talked a bit about his work. By the time Henk and I were about ready to hit the bar again Andy returned saying that the rest had already retired for the night (normally the dark part of the day, now just the same grayness :). We decided to go and have a look anyway and found at least some of the Dutch still going strong. So were some Germans and the Fins who'd won the breakdrum-shot-put competition. Although the latter were sort of cheating by drinking milk instead of the more serious liquids available. 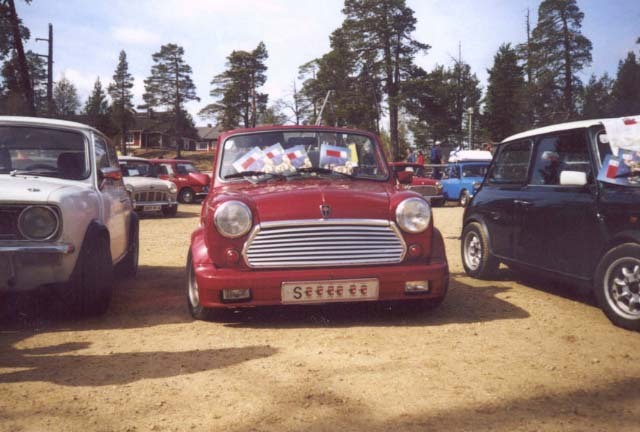 They qualified as a weird bunch anyway though, if not for any other reason then the way they'd decorated the Mini they'd decided to make the 1350km trip up north in. Got up at 11am as the raffle that Pasi H., one of the organizers, had been able to sell me a couple of tickets for was being held at noon. With my Karma not exactly back up to speed yet I of course didn't win anything. But Henko, Andy, Marcin and Pasi R. did win something so all in all we didn't do to bad. The grand prize was won by Philippe Delauw the Belgian organizer of the Belgian Mini Coast Tour. 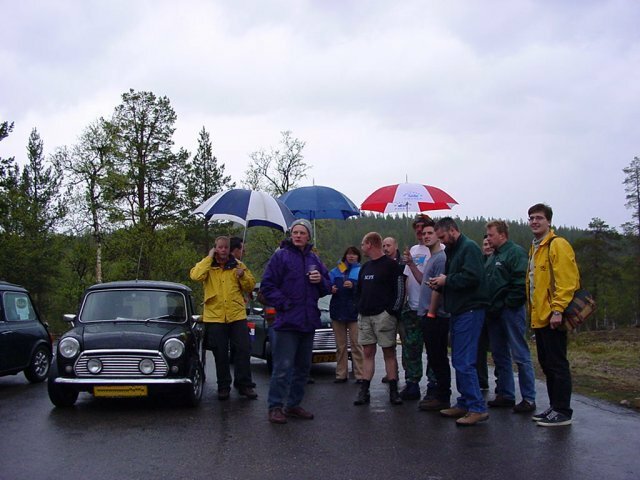 Boris - Scott's Mini, A - I, S - Scott, K - Kim, H - Henk, Ab - Andy B. Back at the apartment we had a look at some maps trying to figure out who was going where and when. In the end Andy, Manon and I decided to head for the NorthCape, John and Yvonne planned a route south that would enable them to visit some of the towns along route and Rik was going to head home, dropping Henk of in Rovaniemi on the way. I then first hit the Jacuzzi again before we did another Walkabout of the grounds, to find that most the Mini's hadn't returned to the display area. As some were already leaving and others were packing up we said our good-byes to all our Miniac friends and wished them all a safe return home. Dinner was next and the rest of the evening was spend hanging at the apartment pre-packing, talking, drinking and basically being merry. As we all had a long day ahead of us we called it a night at about 2am. The official end of the IMM. Got up at 8am and sleepwalked to have breakfast, a first for me that weekend :) Finished packing and loading everything in the Van again. 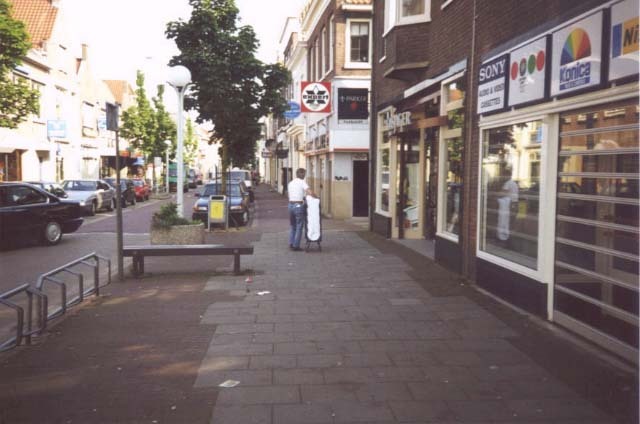 Rik, Henk and Theo already had gone their separate ways by then. 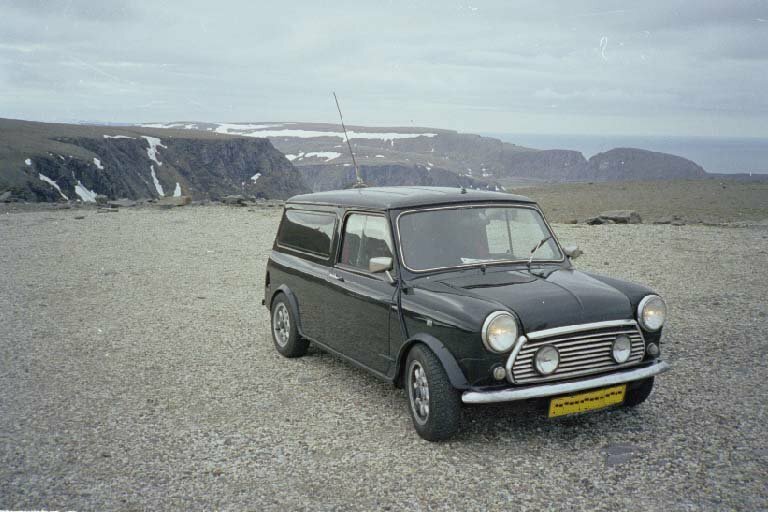 Said goodbye to John and Yvonne who were going south and together with some of the Dutch Miniacs headed up north towards the North Cape. 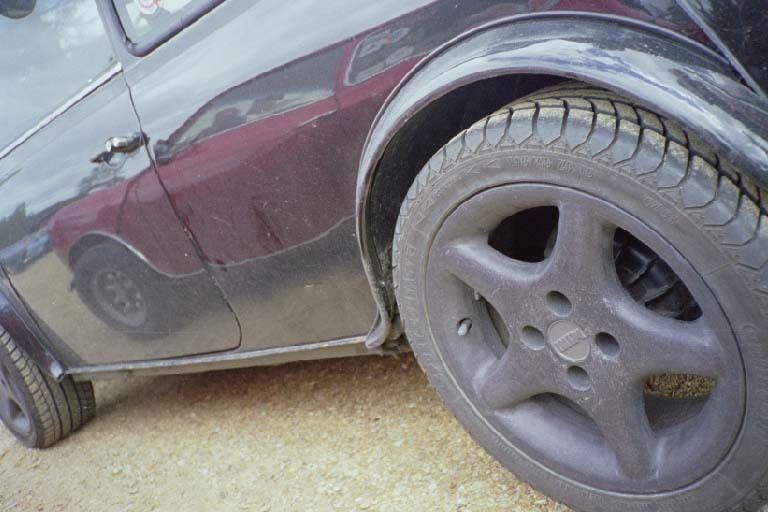 Some of the roads upwards were really bad ones, albeit having tarmac, but also a lot of holes and bumps in them, which made the wheels hit their bumpstops and the arches in a nasty way a couple of times. After taking in gas for the second time my remaining wiper decided to pack it in. Later it turned out the cable had got stuck on the 2nd notch and after a bit of persuasion it worked again. In Norway the scenery changed from what we'd been used to; forest and lakes to the more rugged view of the Porsangen Fjord. Although the roads were better then we had been told, there were some bad stretches of gravel road. 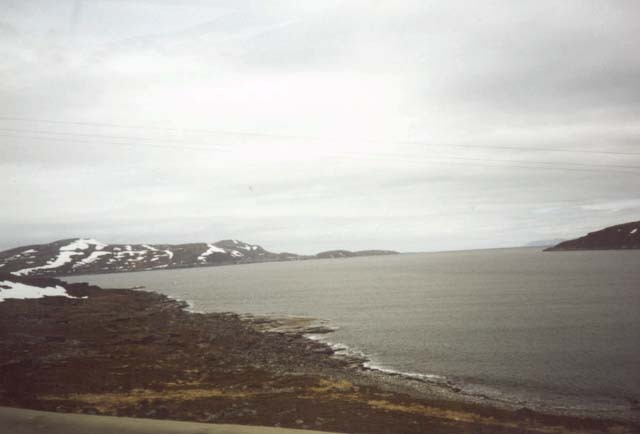 We finally did make it to the North Cape, basically a rock with a view on water and some touristtraps. In short one of those 'Been there, Done that, Got the T-shirt' places. And yes, we made it; were there, did it and got some T-shirts :) On the drive up we'd passed a couple of Mini's, of which only one Marcos showed up while we were there, as well did Theo. 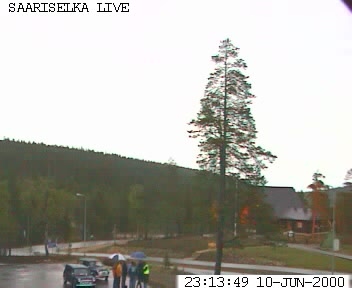 As there really wasn't that much to hang around for, we decided to try and make it back to Saariselka again that day. On the way back we met Henko & Dennis, HW & Remco and their group, who'd taken a more relaxed pace. The overcast, chilly and at times rainy weather wasn't inviting for a 'stop and smell the roses' kind of trip though. We said good-bye to them and started out on our drive back again. Although reception had been open 24h during the IMM I'd gotten the impression this wasn't the case on normal days and as I found when I called ahead they indeed closed at 10pm. 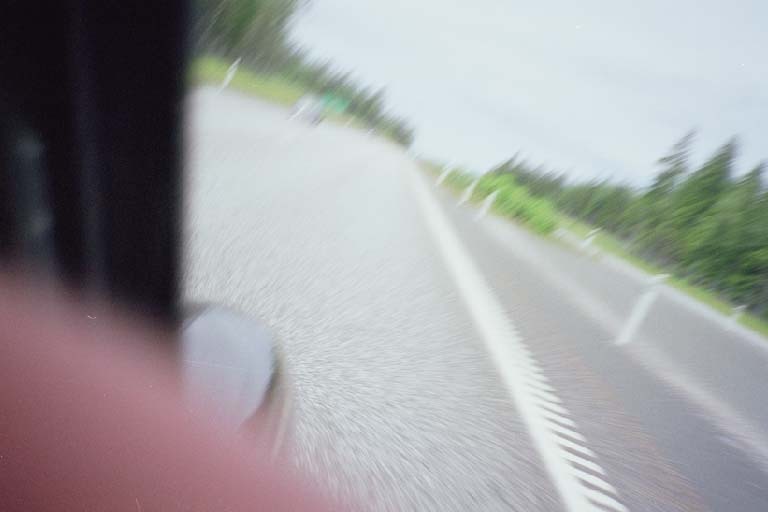 As Andy & Manon stopped in Ivalo to get some cash, I had to do some serious speeding in the end on what by that time were mostly gas-fumes in order to make it back time, but I did. We got a double bedroom apartment this time, again with sauna. 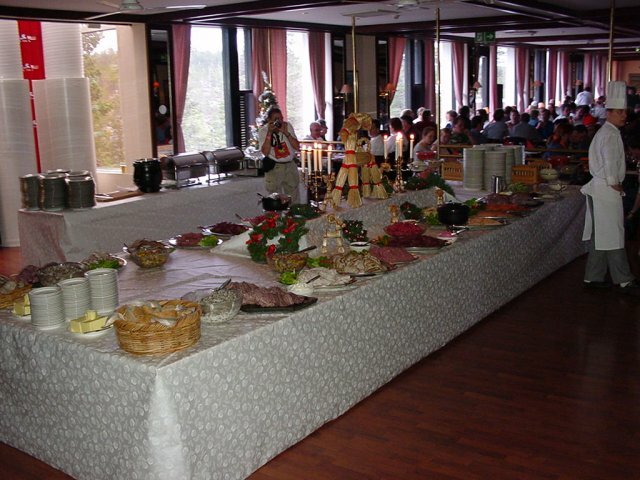 I must say that the cost-quality level of the Tunturi hotel is at a very high level. The bar, where we got ourselves some bar-food, was a very different picture from the nights before, with now just the three of us there. Nice and quiet. Talked to the woman running the bar for a bit and learned that only about 4000 beers had been drunk that weekend. I guess a number of people came prepared and had brought their own :) After hanging out at the apartment for a while and looking at the MTV awards for a bit, we turned in at about 1am. Tue 13th - Thu 15th June. Wednesday was pretty uneventful. Made good time driving down to Stockholm (we'd planned to at least make it to Uppsala) but got stuck in the rush-hour there for a bit again. Arriving at Jonkoping we decided it would be best to take advantage of the good driving conditions and try to make it back to Helsingborg. Called ahead to the campsite we'd stayed at on the way up and sort of got a reservation sorted. One thing that did change along the way was the fact that it got dark again in the evening. So we now got to practice our 'creating 3-lane roads on 2-lane roads' techniques in the dark with trucks going both ways. Sometimes having a small Mini is an advantage :) After some 1250km we arrived at the campsite in Helsingborg around 'half 11pm' (23:30 for normal folks :) and after a call or three got the cabin sorted. During the trip down I'd been in contact with John and Yvonne who were always a day ahead of us. As such they could warn us of a heavy trafficjam near Bremen so we decided to follow the detour as indicated on the radio, which was a nice country drive. We made good time again and made it back to my place at around 21:30. The rest of the evening was spend eating, unpacking, letting people know we made it back alright and getting my puter back online to catch up with my email (yeah, yeah, I know I'm a junky by now :). After having my pictures developed and doing some other shopping John & Yvonne dropped by on their way home and we enjoyed lunch in the sun at a local bar, Had a look at the pictures and basically enjoyed the weather and the company for the last time in a while. At around 3pm as well John & Yvonne as Andy headed back home, which marked the end of this great adventure. 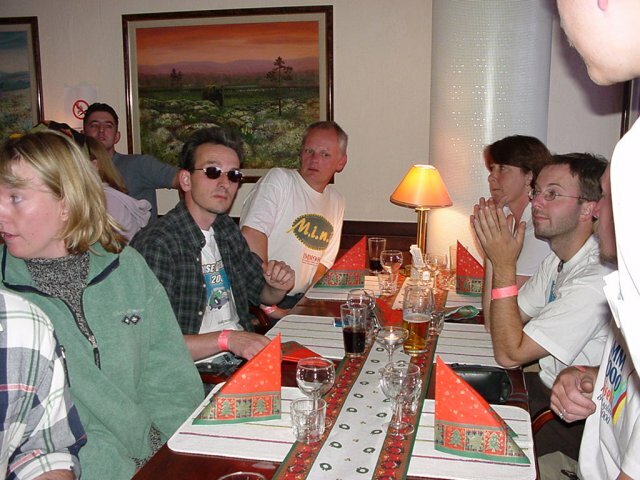 Pictures (c) 2000 Andy Smith, Manon Overgaag, Marcin Dobrucki, Scott Beavis, Rien Post and myself. Unless stated otherwise descriptions are LeftToRight. This page was 'sponsored' by Fotolux. Can't get enough of these IMM 2000 Reports ? Below are links to a couple of others.